Atlanta-headquartered Delta Air Lines has begun selling its Delta One suites and Premium Select seats for flights from the U.S. to Asia that will begin this fall. The new Delta Premium Select cabin and the Delta One suite product enhancement will debut on Delta’s (NYSE:DAL) first Airbus A350XWB, which is due to enter service in the fall and make its first passenger flight on Oct. 30 from Detroit Metropolitan Airport (DTW) to Tokyo’s Narita International Airport (NRT). Designed with an emphasis on exceptional customer comfort and privacy, the Delta One suite will offer each customer full flat-bed seats with direct aisle access; a full-height door; sliding privacy dividers between center suites; in-suite, customizable ambient lighting; dedicated stowage compartments for shoes, headphones and laptops; memory foam-enhanced comfort cushion; an 18-inch, high resolution in-flight entertainment monitor; and a universal power outlet and high-powered USB port at every seat. Delta One service includes chef-curated meals with wine pairings recommended by a master sommelier, noise-canceling headphones, TUMI amenity kits, and in-flight lounge wear on select flights. 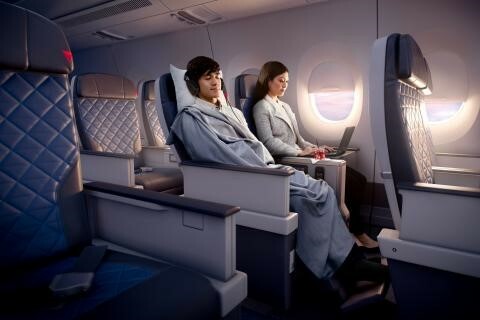 Delta Premium Select cabin will feature seats with up to 38 inches of pitch, up to 19 inches of width and up to seven inches of recline. Delta Premium Select seats will also offer adjustable leg rests and head rests. Premium Select service will include a TUMI amenity kit; noise-canceling headphones; pre-departure beverage service; seasonal menu selections; large, high-resolution monitors for the in-flight entertainment system; in-seat power ports for large and small devices; ample storage, and Sky Priority service which includes faster check-in, accelerated security, premium boarding and expedited baggage service. 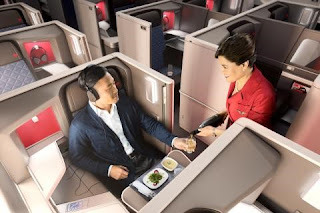 In addition to the DTW-NRT flights, Delta Premium Select will be sold on select flights from DTW to Seoul, Korea’s Incheon International Airport (ICN) for flights scheduled Nov. 16 and beyond, as well as on select flights from DTW to Beijing, China for flights scheduled Jan. 17, 2018, and beyond. The enhancements are part of the airline’s multi-billion dollar investment in the customer experience that includes a cabin modernization program featuring new seats, seat-back entertainment systems with free entertainment, high-capacity overhead bins, access to Wi-Fi on nearly all flights, free Main Cabin meals on select flights, upgraded free Main Cabin snacks, chef-curated meals in Delta One, and a seasonal wine program, among other features. Delta will be the first U.S. airline to take delivery of the Airbus A350XWB, which stands for “extra wide body.” The new aircraft provide better fuel efficiency and customer-friendly features designed to improve the flying experience, according to the aircraft manufacturer. The long-range Airbus A350 will continue Delta's optimization of its Pacific network, operating primarily on long-range routes between the U.S. and Asia. The jets are expected to generate a 20 percent improvement in operating cost per seat compared to the Boeing (NYSE:BA) 747-400 aircraft they will replace. Following the A350 debut, the Delta One suite will progressively roll out on Delta’s Boeing 777 fleet.